Car donation programs have become more popular over the last decade or so, as more charities are looking for new and creative ways to generate funds. Today, the number of charitable car donation programs numbers in the hundreds or even thousands. If you have a favorite charity you like to make donations to, it is probably possible for that charity to receive at least a portion of the funds when you donate your used auto. Most used auto donation programs will either sell the vehicle to raise funds for the cause, use the vehicle in the daily operations of the organization, or give the car to a someone in need either for free, or for less than the fair market value. Charitable car donation programs allow you to donate your used auto to the charity of your choice. You can click on your state from the list below to find a charitable organization in your state to donate to. When you choose to make a donation of a used vehicle, if the charity sells the vehicle for more than $500 they should mail you a receipt that allows you to deduct the sales price of the vehicle on your tax return. If the old car you decided to donate is not worth at least $500, than the IRS allows you to determine the fair market value. This is the value that someone would be willing to pay for the vehicle if buying it from you. In order to claim the tax deduction, you will need to itemize your deductions on your tax reture. By doing this, you make out by getting rid of your used car, truck, RV, motorcycle, or other vehicle, without having to sell it. You claim the tax deduction, and the charity either gets to use the vehicle or sells it and uses the proceeds for the good of the charity. That is a win-win for everyone involved. If you have a charity in mind you would like to donate to, you can do a search to see if your preferred charity has a car donation program, or if they are affiliated with another organization which shares the proceeds with them. While there are many benefits to charities that receive donations from individuals, the benefits to the you, the donor may not be as clear. The biggest benefit that most people hear about is the opportunity for a tax deduction. This means that the resale value of the donated vehicle can be written off on your tax return. There are some limits on this type of deduction, so you may want to talk to a tax professional before making the donation. 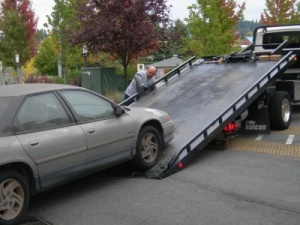 Another benefit of donating a used auto to charity is the opportunity to just get rid of the vehicle without having to try to repair or sell it. Most charitable car donation programs will except vehicles whether they are running or in need of repair. Some cars or trucks that are beyond repair will be sold for scrap or parts and any money received will go to the charity. Besides the charitable tax deduction and not having the hassle of dealing with an old vehicle, the feeling of being able to help those in need may be the best reason to donate your car to a charity. When you have chosen a charity to donate your used vehicle to, sign the car's title over to the charity or their agent. This website is not affiliated with any of the charities mentioned. All of the trademarks shown are the property of their respective owners.